Simplify your corporate telephony solution by connecting your IP PBX or TDM PBX to the Optus Evolve network. 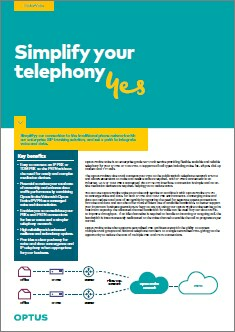 Does your organisation have the telephony solution it needs? 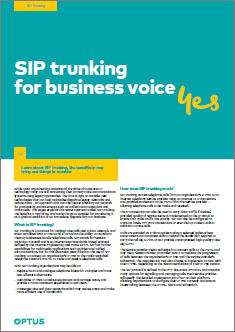 Optus Evolve Voice is a SIP trunking telephony service which connects your IP PBX to the public telephone network, over a single IP connection. This simplifies the network and allows for greater flexibility and scalability. A TDM PBX variant is also available. Optus Evolve Voice uses Optus Evolve advanced network so, if you wish, you can simplify your network even further by converging your voice and data traffic on a single connection. Optus Evolve Voice is a SIP voice trunking service which connects your company's IP PBX to the public telephone network (PSTN) over the Optus Evolve® network so phones attached to the PBX can make and receive voice calls. It uses Optus Evolve IP VPN. Optus Evolve Voice provides a flexible, scalable and reliable telephony service. Simple connectivity - Connect to PSTN via simple Ethernet SIP trunk connection, without mediation equipment. You can also replace multiple connections with a single one. Scalable - Easily add voice channels as needed. Standards-compliant - works with most IP PBXs. Ready for convergence - Option to use the Optus Evolve IP VPN connection for voice only or voice and data. A TDM PBX is able to be connected to an Optus Evolve Voice service in the same simple way it is connected to a traditional TDM telephone service. You are able to change to an IP PBX at any time in the future, without the need to change the trunk. Simplified connection to the PSTN - A simple Ethernet cable provides the connection from your IP PBX to Optus Evolve Voice and to the PSTN. Reduced infrastructure - No need for mediation devices. Converged voice and data connectivity - Use a single access for voice and data via Optus Evolve IP VPN, reducing total cost of ownership by removing the need for separate access connections for voice and data. Enhance data traffic performance by utilising idle voice bandwidth for data. To find out more about how Optus Evolve can transform your business, contact your Optus Account Manager. Connecting your IP PBX to the PSTN is simplified with Optus Evolve Voice. A simple Ethernet cable provides the connection from your IP PBX to Optus Evolve Voice and to the PSTN. Optus Evolve Voice delivers the telephone service in native IP format so you can directly connect your IP PBX to Optus Evolve Voice via a router at your premises. Mediation devices (i.e. media gateways) are no longer required at your premises. The Optus Evolve Voice service is available by itself for a voice only solution or combined with the data traffic capabilities of Optus Evolve IP VPN for a converged voice and data solution delivered via a single service. Simplify your connection to the traditional telephone network and set a path to integrate voice and data. Learn about network solutions that can help you connect and thrive.